Inspired by this morning’s presentation, today we’re releasing the third installment of our “Research Recap” blog series, featuring posts that highlight a particular finding from our recently published impact study, and taking a closer look at “social capital.” The term refers to the value that is derived from existing within and being connected to social networks. While the term itself has been around for more than a century—and the practice, even longer—it’s becoming more prevalent in today’s lexicon, as more and more towns and cities recognize the importance of building a stronger and more cohesive community. A quick survey of any Levitt lawn will show family members, friends and neighbors enjoying each other’s company. Like most free, outdoor concerts, Levitt concerts are social! These inclusive and informal arts experiences have been found to be hybrid experiences—allowing audience members to both experience high-quality music while simultaneously embracing the communal setting and interacting with fellow concertgoers. Levitt concerts have been found to foster deeper bonds both within established social groups (referred to as social bonding), as well as across demographic boundaries (referred to as social bridging). Music is the catalyst for connection at Levitt concerts. It ensures that the experience is not merely a random coming together of people from different walks of life in a public space, but rather a shared, communal experience that diverse individuals have together, as a community. One study participant described her experience attending Levitt Pavilion Pasadena concerts saying, “I don’t have a lot of family here and it is a nice, warm feeling to be there. I feel connected to other people there, and it feels like family.” And research shows, she’s not alone. 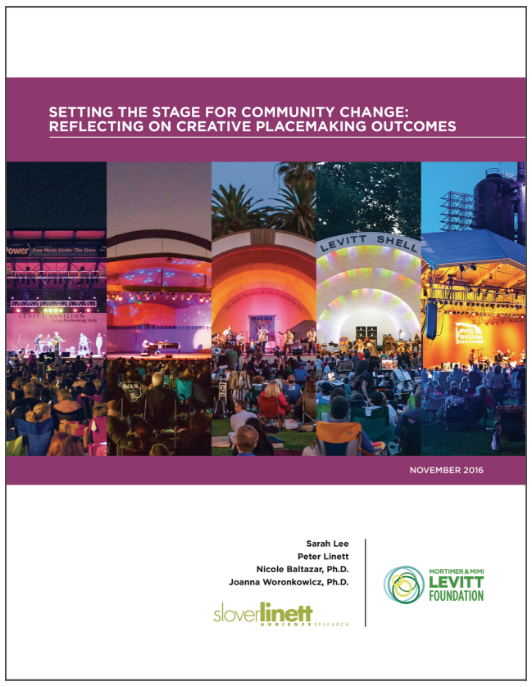 As the above figure shows, over half of concertgoers surveyed indicated that they feel connected to their local community when attending a Levitt concert. Feeling connected to a place (and more importantly, the people in it), makes that place a more desirable place to live. As towns and cities look to establish more points of connection, understanding and exchange across diverse social groups or communities, they’re more likely to build social capital, which in turn deepens resident attachment and helps strengthen the social fabric of a community in the process.